One of the most challenging things as a young working woman can be stepping back from work and taking a vacation! As a young professional you want to see your career grow and inevitably are working extremely hard in your chosen profession. It is important though to take of care of yourself – and that means allowing yourself time to relax and recharge. Today I wanted to share 5 simple tips for succeeding at doing that; for actually taking a break while on vacation. Even if you aren’t doing any actual work while on vacation, seeing emails roll in about work, or even voicemails & texts, can significantly impact your ability to de-stress; even without your realizing it. So, my number one tip to actually relaxing on vacation is to plan at least 1 day where you have no access to your phone- meaning no access to work calls or emails. Of course you may still need your phone to take photos, so put it on airplane mode for the day! This one small change can make a huge difference in your stress level. If your job allows it, give yourself more than a day sans phone, but at the bare minimum take one full day. How many of us have left work on a Friday afternoon with a list of things to do on Monday morning? *guilty*. Before you go on your vacation, one of the worst things you can do is leave yourself with tasks to be completed your first day back. Inevitably, things will come up while you are away and having your entire schedule free your first day back at work solely to address those things is essential. Not only will it make your first day back less busy but it will allow your mind a better break while you are away as you won’t have any (immediate) ongoing project or “to do lists” to think about. To put your mind at ease about any work emergencies (and thus quell the inevitable ‘but I NEED to check my email’ feeling) plan in advance to have a colleague ‘cover you’ while you are away. Obviously no one can do your entire job, but having a colleague that you have a reciprocal vacation relationship with can give you so much mental freedom while on vacation. If you don’t have this already, think about who this sort of a relationship would work with – and then take them out to lunch to discuss and hash out the details! The details can be super specific to your profession / job role; giving this colleague the ability to actually do work while you are away. Before you go on vacation, have a meeting with this colleague where you give them the run-down of any ongoing work projects, and any issues you anticipate may come up while you are away. I do this with two fellow lawyers before I go on vacation and it has been one of the best things in allowing me to relax when I am away. Knowing my work is in good hands is fantastic. It is nearly impossible to just “turn off” the work part of your brain. You’re going to wonder how client A is doing, how the pitch on project B went, or whether you left the damn space heater plugged in in your office (… also guilty). Have a plan of attack for when your mind turns to work. Obviously, you are on vacation to relax and for many people that means doing nothing – but – know how you want to distract your mind when these work worries hit. For me, that means having a book and magazines to read. The last thing I want to do is read anything work related while on vacation (obviously) and usually I just really want to work on my tan and drink a margarita haha. If I lay in the sun too long though, thoughts of work will creep in, so I always have a magazine or book on hand to fix that. It seems obvious, but make sure before you leave that you change your voicemail and automated email response to indicate that you are on vacation. More specifically, tell people that you will not be addressing work matters while you are away. Indicate that you will not be checking email or phone messages during your time away. This will ensure that noone is frustrated when they don’t hear back from you promptly and it has the added bonus of decreasing the amount of messages you get in the first place! Many people, upon hearing that you won’t be checking your phone will simply choose to call back at a later date. It can feel neglectful to simply say that you won’t be checking messages. Many young professionals feel guilty doing so. This is where your ‘vacation helping colleague’ comes in handy; at least in assuaging your guilt, as while you may need to tell people you will not be checking messages you can tell them to call/email XYZ for assistance during your time away. "Wednesday Wants: Sales, Off the Shoulder Styles, and Summer Accessories"
Great tips, and adorable look! Love the gingham top! Thanks so much Elise! Glad you liked the post. Thank you so much Ada! I am so glad you like the tips! And this gingham top is one of my favorites for summer! I can't get enough of it haha! That gingham top is adorable! 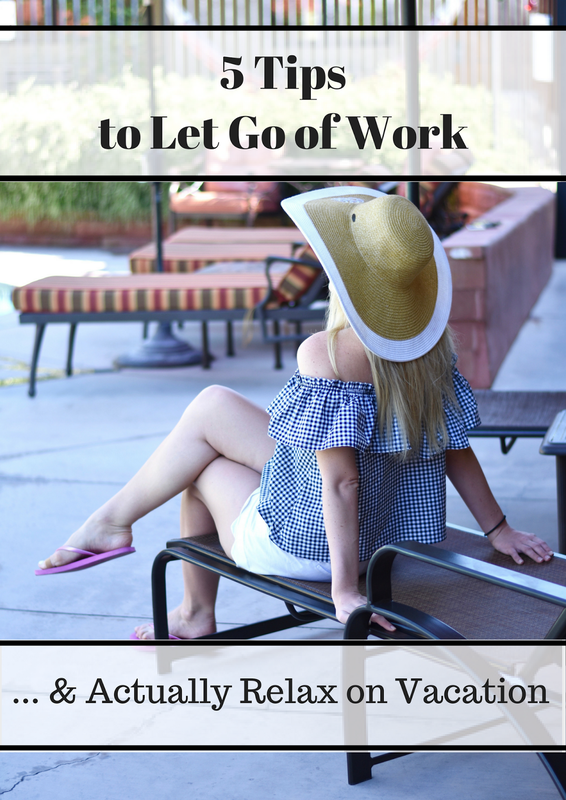 And great tips – I am so guilty of still thinking about work when I'm supposed to just unwind! Thanks Jess! And exactly! – it is so hard to let work go and quiet your mind, so hopefully these tips can make it at least a little bit easier! Love these cute photos and all the great tips you shared! It is so difficult now to truly step away from your job and fully relax while on vacation. I really like the idea of having a vacation helping colleague. Thanks so much for linking up with Fabulous Friday! Aw thank you Jennie! I am so glad you liked the post. Hope you are having a great week!